VMWare player failed to load virtual machine image that was originally created from another computer. When .vmx (VMWare configuration) file is opened from VMWare player and VMWare Player display an error message appeared something like ‘The configuration file was created by a VMWare product that is not compatible with this version of VMWare player and can not be used’. 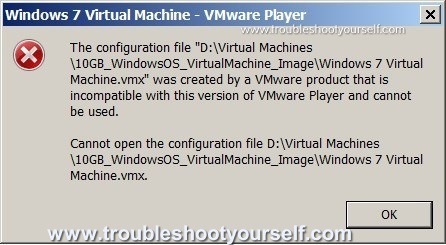 In this article learn how to solve this problem and load Windows 7 virtual machine image using VMWare player. The configuration file [.vmx file path] was created by a VMWare product that is not compatible with this version of VMWare player and can not be used. 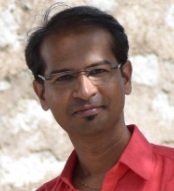 The .vmx is a primary configuration file generated by VMWare player (or VMWare workstation) and used to stores virtual machine settings chosen while creating the new virtual machine. The .vmx configuration file can be opened using notepad to see the virtual machine configurations. Here is the .vmx file quick look opened in notepad. The .vmx configuration file stores one important configuration parameter called virtualHW.version. 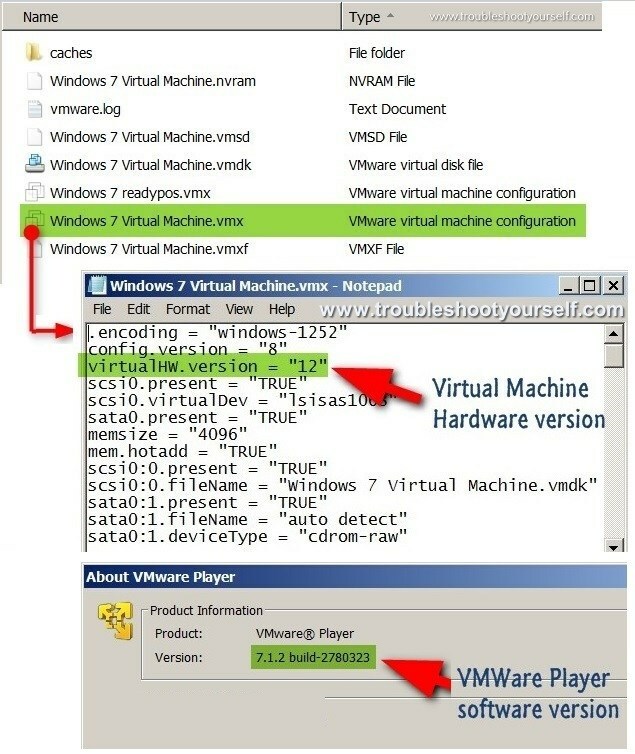 VMWare player do not power on the virtual machine, if the hardware version of the virtual machine is higher than what is supported by the installed VMWare player. Here is the table which shows the mapping between virtualHW.version and VMWare player product version. Also,VMWare player power on the virtual machine, if the virtual machine hardware version is lower than what is supported by the installed VMWare player. When you receive this error, verify whether virtual hardware version (virtualHW.version) of the virtual machine is inline with the VMWare player (or workstation) version with respect to table provided above. If you observed any miss match then take below suggested actions accordingly.